Taking onboard advice from the experts! Taking onboard the advice from the Dream Team! We asked some of StreamElements DreamTeam members to share some winning tips for live streaming success. They are all experienced and seasoned partnered streamers and we hope that you will find their advice useful! Oh, this is a great one for me, since I only get between 10-20 or 20-30 on the weekend on my channel. I didn’t feel positive after he mentioned that he ‘only’ had 25 viewers when he started on Twitch – ONLY! I would do anything for this consistently! When I started I had a big fat zero as my viewer counter although family members would come along and watch me just so I got off that zero viewers. I must also admit that I was quite pleased to have some of those channel bots in my stream at the beginning, made me feel that at least someone was watching – anyway back to hjune’s advice – Start on YouTube first! Well I have a YouTube Channel so hopefully a combined approach might be beneficial. I do like the way that he finishes his post – couldn’t agree with him more! Treat everyone with excitement and respect, and you’ll have an amazing group of people around you in no time. Ooooo panels! 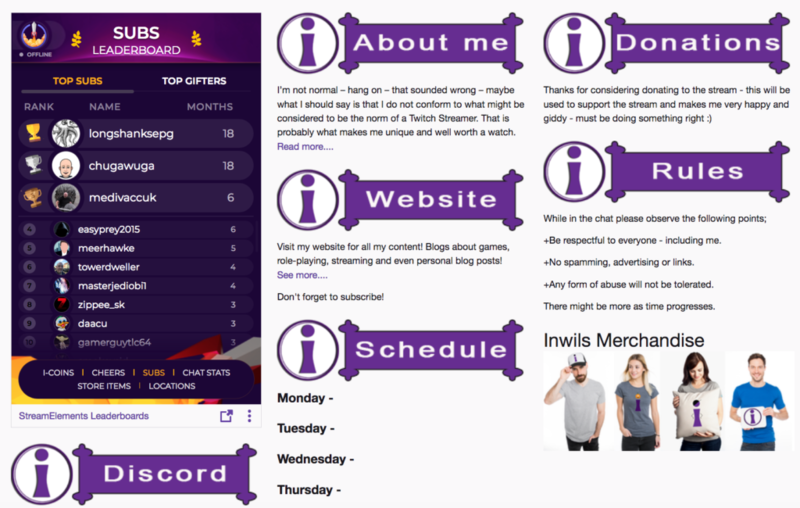 I really like these on Twitch, although I wish we could have more – I have the limited three at the moment, but would like some about clips and my twitter feed! So what does Ron_plays_games have to say about panels? He advises to get them done promptly and make them look good. Well, I must admit that I was lacking in this area. It was a member of my community that suggested that I should do some work on them, which I have done. I forget his user name (please tell me in the comments if you are reading this!) but he was pleased to see that I had taken his advice. I’m not sure whether they look either creative or professional, but it is the best I can do at the moment. I’m not sure whether they look either creative or professional, but it is the best I can do at the moment. 3) Kaakmans — 3 or 3000 viewers, Give Them All You’ve Got! Oh I completely agree with Kaakman’s post. I’ve actually spoken about this in my Twitch: Don’t grow, enjoy video. Well done! love this short but to the point post by Kaakmans. I’m always genuine in all my streams. Again I echo this in my recent vid. I think it is so important to be yourself. Yes many people will not like it, but hey, there are plenty more other channels to watch. If you are being genuine then you will also enjoy streaming more. It takes a lot less effort to be yourself. Hopefully I have got Kid Kerrigan’s advice in place already! Be genuine and be you and play games that you genuinely love to play because laughter is contagious! Okay, you might have noticed that I have missed out “Snappy — Practicing English Makes Perfect” post. This is because it was about English as a second language which I feel doesn’t really apply to me, although sometimes the way I stutter and stumble over my words you might think my native tongue is actually a second language to me! Onto Foxxell’s post. I love bullet lists and I was happy that there was some bullet points in the post. Time for me to tick off the ones I do and add the other ones to my target list. Deep breath! Here goes! Or, you’re really doing a lot of networking with others to profit from different communities melting together. Drat – here comes the ones which need working on. Networking – ouch! I’m not good at this at all. People and me don’t mix well. I do often try to say funny things in other people’s streams but it never seems to go down well. I like to say ‘hi’ as I arrive, which usually gets a reply. I think I network better with small streamers rather than trying to get into the action with the big hitters! I can try more with this point – watch this space! “Be very good at what you’re doing…’. Yes, well. If you have ever watched my play games you might be aware that I’m actually not very good at any of them. In fact, as this videos shows – I’m pretty bad! Well to quote Snappy’s post, practice does make perfect, so I will definitely add this to my list to improve on. I guess that actually playing the games more will support both my gameplay and game knowledge. Just to show you how bad I am …. This streamer is mainly on Youtube, so although I do live stream sometimes to that platform. I think I might be doing more streams to Youtube, although these will be very specific – thinking more adventure creation and creating overlays and setups. However, what BestSmoothJazz does provide some valuable advice towards is how to deal with those ‘trolls’. Due to my uniqueness I get quite a lot of these so will definitely implementing his advice. If you do encounter trolls, it’s important to remain respectful and remember that you are the streamer, so you need to be the better person. So, I definitely have a lot of things to work on in 2019. I enjoy streaming immensely but I also want to grow as a streamer and more viewers, subs and followers are one way to assess this journey. Don’t get me wrong, I am not reaching for the stars here. I am not in the same bracket as the ‘big’ streamers but I feel that I can still get better on both Twitch and YouTube so I will still aspire. I’ve really benefitted from the Dream Team’s advice and I will take all of it on board and maybe, just maybe, you will, one day, see my own own advice in a StreamElement’s blog post! Growing my Twitch Channel #4 – My Equipment! !